I am not a fan of yearend prognostications, because they usually are no more than statements of the obvious or retrospectively fortuitous guesses. Even though I usually sidestep the idle midwinter idyll of predicting the upcoming year, I am going to make an exception for 2010, because several friends and correspondents have pressed me for answers to three significant questions. In a moment, I will provide you with the same weaselly answers I gave them, but first here is some insight into the thinking underlying each response. We are in utterly uncharted territory with respect to the four factors that make a market: (a) the global economy, (b) consumer behavior, (c) advertiser behavior and (d) the potential response to the above variables by the captains of the media. In addition to these known unknowns, any number of unknown unknowns could be lurking out there, too. 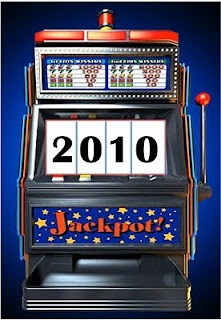 Will we have to pay for online content in 2010? In some places, yes. In some places, no. The answer depends on the type of content and the publisher. While some publishers may get around in 2010 to successfully launching subscription Internet and mobile products, most publishers are likely to adopt hybrid free/pay solutions, with the emphasis on free instead of pay. The few publishers who try to put everything behind a pay wall will be business-to-business publications (like the Wall Street Journal) or those who provide truly unique content to an isolated bit of geography where they have unrivaled control. Notwithstanding the best efforts to charge for content, interesting and valuable information almost always will turn up in the clear on the web in short order. This unavoidable phenomenon will further incentivize publishers to play whack-a-mole with copyright poachers instead of developing compelling products and services to attract readers and advertisers. Will advertising sales rise, stabilize or continue to dive? The answer depends overwhelmingly on whether and how much the economy improves. If you believe the economy will improve vigorously, then it stands to reason that retailers and car dealers will step up advertising. If the economy expands vigorously, employers will start buying ads to fill jobs. If the housing market revives vigorously, then real estate agents will resume advertising. Even if all this occurs – and there can be no guarantee that a recovery is imminent or will be sustained – it does not follow, however, that advertisers will return to their former behavior. After being forced to do more marketing with less money during the worst economy since the 1930s, advertisers in every key newspaper and broadcast category have learned to become increasingly proficient at low-cost, highly-targetable, meticulously-measurable interactive advertising. The thousands of retailers and car dealers who succumbed to the most difficult economic conditions in generations simply aren’t there to buy advertising any more. Several of the remaining big-box retailers use little, if any, newspaper or radio advertising, relying instead on rock-bottom pricing to draw patrons away from independent merchants – the ones who still buy ads – who cannot compete with them. Auto dealers know that eight hours is the median amount of time consumers spend shopping on the web before contacting a dealer. Car manufacturers and sellers are focusing their efforts on intercepting customers online, not luring them with broadcast or newspaper ads promising free hot dogs and pony rides. Employers have learned to post vacancies on their own websites or at low- or no-cost job boards targeted to their particular industries. Real estate argents know they don’t sell houses with newspaper ads. They buy them to please sellers, who want some tangible proof that the agent is trying to market their houses. As more sellers and buyers become accustomed to shopping for homes at sites like Realtor.Com and Zillow, newspaper advertising will become increasingly irrelevant. In other words, a rebound in the economy will not necessarily translate into a recovery for newspaper, radio or local television advertising. Will more media companies go out of business? Some will. Most won’t, absent a complete meltdown of the economy. The question is how wounded the survivors will be and whether they have the imagination, the wherewithal and the will to reclaim anything near their former strength. Both consumers and advertisers are forsaking the mass media model that made newspapers and local broadcasting such powerful, lucrative businesses in the post-World War II era. Not many years ago, newspapers and broadcasters respectively were able to generate profits of 30 cents to 50 cents on a dollar of revenue. The abundant profitability of those monopoly-like businesses made it possible for them to stay in the black by whacking expenses when advertising began contracted in 2006 (well before the economy drooped). Some operators were so good at expense management that they were able to sustain amazingly respectable levels of profitability in 2009 in spite of the worst ad recession in modern history. But even the companies that weathered the storm are far from being out of the woods, to mix a pair of metaphors. If advertising demand fails to rebound when the economy does – or, worse, continues to contract because of secular changes in consumer and advertiser behavior – then, regardless of how skillfully media companies slash expenses, the high fixed costs associated with operating the legacy businesses eventually will eat them alive. The long-term survival of the traditional media companies will depend on their ability to create products and services to attract and delight the consumers and advertisers of the interactive age, whose loyalties last no longer than it takes to click a mouse. To date, the energy and creativity of most publishers and broadcasters have been focused on trying to salvage the increasingly anachronistic business models of their forefathers. If they don’t change their behavior in 2010 and beyond, they may pass the point of no return – assuming they have not done so already. "The long-term survival of the traditional media companies will depend on their ability to create products and services to attract and delight the consumers and advertisers of the interactive age, whose loyalties last no longer than it takes to click a mouse." Who's going to create those products and services? At many (most?) media companies, the enabling people and processes have all been sacrificed to maintain acceptable profitability. My prediction is that, in five years, the truly successful media companies won't be those who reacted like turtles during this recession. Instead, they will be companies who (1) recognized that opportunities are enhanced by the timidity of competitors; (2) approached product development as a science rather than a haphazard, black art; and, (3) weren't afraid to invest for a profit more than three months down the road. > there to buy advertising any more. The people who stopped advertising their stuff in the classifieds, and switched to Craigslist and Kijiji(sp) won't be coming back any time soon. There are a couple of factors you didn't mention about job ads. Hiring is usually a trailing indicator of an economic recovery. Don't expect hiring to pick up significantly before late 2010. Also, there are a lot of very qualified applicants pounding on employers doors, and mailing in resumes right now. Until that hiring pool is cherry-picked clean, don't expect employers to advertise unnecessarily. Another key component of ad sales is newspaper circulation. Advertisers of all stripes will be reluctant to pay identical rates for reduced reach. See http://www.naa.org/TrendsandNumbers/Total-Paid-Circulation.aspx and download their spreadsheet at http://www.naa.org/docs/Research/Total-Paid-Circulation.xls Then plot the numbers. It's scarey. Total weekday circulation has been steadily falling since 1991 and Sunday circulation since 1994. In 2005, both declines, especially Sundays, turned into power-dives (2005, 2006, 2007, 2008). That was *BEFORE* the economy collapsed. This is a secular trend that is unrelated to the economy. I expect NAA circulation numbers to have plunged sickeningly in 2009. The 2010 percentage may not be as bad, but the numbers will still be below 2009. Once they get below critical mass, newspaper inserts won't make economic sense. With that revenue gone, even more newspapers will fail. Barring a bailout 2009, with "merely 142" newspaper shutdowns, will look like "the good ole days". My big prediction for 2010 is a desparate flurry of attempts to legislate taxpayer-financed bailouts for newspapers in the USA. I don't want this to become a re-run of various political rants from the past, but I think the battle lines are clear. The lib-left (i.e. Democrats) will push for a bailout, while the right (i.e. republicans) will oppose it. Given the expected mid-term losses for the Democrats, there is a sense of urgency to get it done before the mid-term elections, while the Democrats still control both the House and the Senate. Our campus paper has had a lot of trouble getting traditional advertisers to buy online. Most of them don't even want to have free online adds. I don't understand this. It seems to me that online ads would be great for businesses. But I know nothing about advertising. Can you please enlighten me? Tom Curtin wrote: I teach at IMD (International Institute for Management Development - www.imd.ch) on media on a visiting basis. I conduct a simple exercise among participants who are, for the most part, senior managers. I ask how many people on the programme buy a daily newspaper. Generally, about 25% say 'yes'. I then ask how many of their parents bought one and the answer is almost 100%. I won't be around to ask the same question in a generation's time but I can extrapolate the answer. I reckon newspapers - as we know them (and I stress this) are heading the way of hot-metal typesetting - a quirky and specialist art form. As a former print journalist, I hope I am wrong. Are we ever in charted territory? I think one of the challenging developments of 2010 will be the need for clear ethical guidelines in media. With free online content and access to information, new rules will have to be developed to govern information use. • Revenue from advertising is not going to come back to previous levels. I can shop for everything I need on line by going to a website and do comparative shopping between retailers for everything from a car to a pomegranate (in fact the last four cars we have bought in this family have been searched for and selected on line). I have not used print ads from our local media over the past four years for any shopping, and I don’t pay any attention to the televised electronic media advertisements either. • Staffs have been cut throughout the industry with more in the offing. While this is extremely disconcerting to the employees, it is a natural consequence of technology catching up with those who do not adapt to changing environments. When I started as an engineer, we used slide rules and plans were ink on Mylar. Now everything is PC and network driven and in electronic media. Those that did not make the transition were left behind. There is more than one engineering/architectural firm that did not adjust to the paradigm shift and are gone. The print industry did not adapt to the internet and is now paying the price. But, while I don’t have an example of it, I firmly believe that there are news organizations out there right now that are getting lean and effective and will survive this downturn and come through stronger. The dinosaurs are going to die off. • One thing I have noticed on this blog is there is a lot of talk about content, but no one defines what the content would be that people would pay for. The first rule of business is to know what your customer wants. I believe that most news organizations do not. You might be surprised at what the readers might want to read. I would gladly pay for impartial reporting that completely covers all aspects of an issue. Unfortunately, impartial is not in the lexicon of any media these days. They are either right/left and wear their views on their arms. Very seldom do I get the feeling I can trust what is being reported is accurate and covers all aspects of the issue. • The newsprint industry, as noted on this website, has always had tremendous returns on investment. Never before have they had to adjust to losses in revenue. The result was bloated staffs and an anachronistic management system that never had to get “lean and mean” to survive unlike the rest of us in the real world that have to adjust at every change. That adjustment to reality is going on right now. My niece worked for a news outlet on the West Coast and noted that they had an executive copy editor, deputy executive copy editor, assistant deputy executive copy editor, copy editor, and coffee fetcher. They only needed a copy editor. For what it is worth, these are my comments. Have at it. The last post was great...that is pretty much exactly what i was going to say.